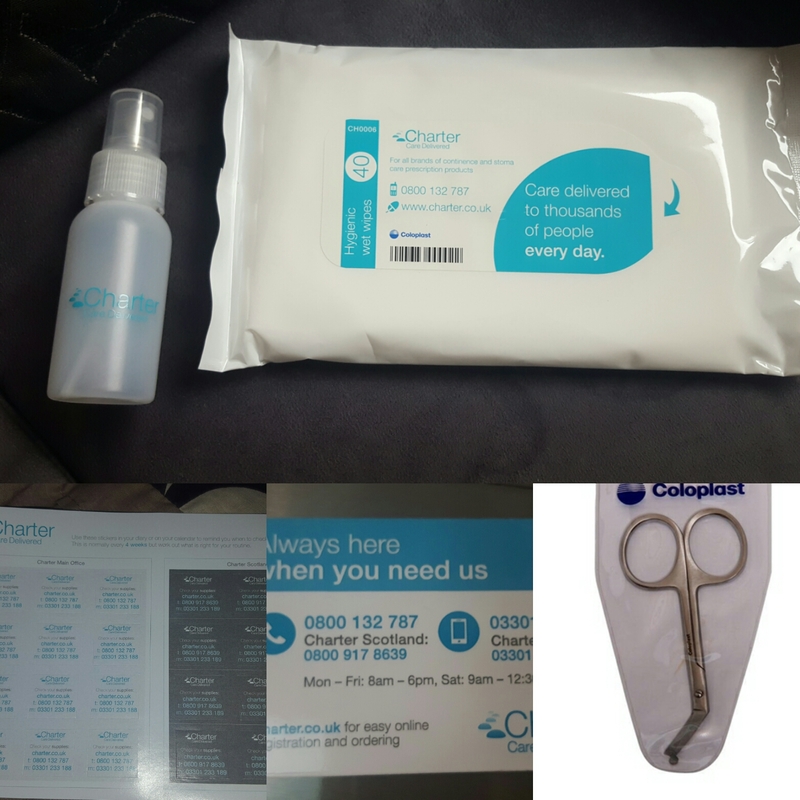 Now I have been chatting with Ellie over at Coloplast for a few weeks and we have discussed different products, she sent me some samples out and some information on Charter home delivery service. I was in desperate need of some barrier rings and didn’t get on with the Hollister ones, I couldn’t get to see my stoma nurse to blag some Dansac ones which I do like. So Ellie popped a sample in the post along with some boomerangs/bananas/extenders whatever you want to call them. Basically they are extra adhesive tape to prevent the wafer peeling and it extends the wear of the bag. These arrived the next day which was amazing I didn’t expect that at all. She also popped some information in regarding a delivery company called Charter as I’m having issues with Fittleworth. She rang me up last Monday to talk to me about how I got on with the products. I said that I liked them etc and that I wanted to move to charter but I hadn’t had chance to sort it out. She told me it wasn’t a problem and she could do it on the phone. BONUS! I got some fancy curved nail scissors with a bit on the tip that must be there to prevent you slicing your bag open, a fridge magnet so I always know how to contact them, some stickers to stick on the calender/diary so I know when I need to reorder, some wet wipes and a water spray bottle. I obviously got things I’ve had before like adhesive remover spray/wipes, barrier spray, dry wipes, disposable bags, barrier rings, the extender tape and of course my convex Sensura Mio bags. Which I’ve decided to have uncut and I just size them as I go along. This is my work go bag. The nice people at birchbox sent this month’s samples in a neoprene bag and I just felt it was perfect for my ostomy supplies. They also sent a sample of antibacterial gel so in that went too! I have a belt, 2x bags, x4 boomerangs, 3x barrier rings, 3x adhesive remover wipes, barrier spray, disposable bags and some curved scissors. They all fit in quite nicely too. So after the last not so happy review I can go back to writing good ones! Well done Ellie, Coloplast and Charter. Favourite bit of Charter? Next day delivery and tracked delivery with texts!